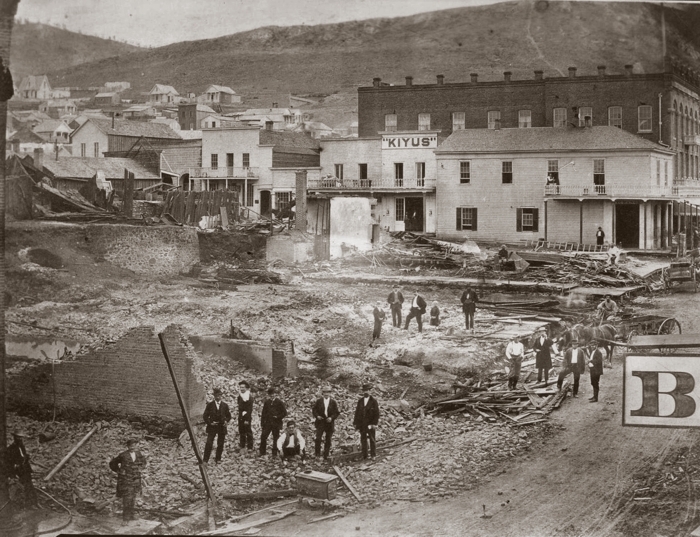 Bridge Street, 1860s, looking east from the Gulch. 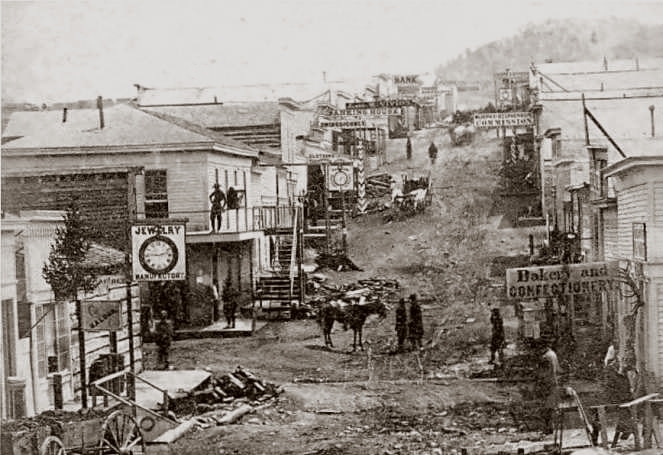 By the 1870s, this was the heart of Helena's red-light district. 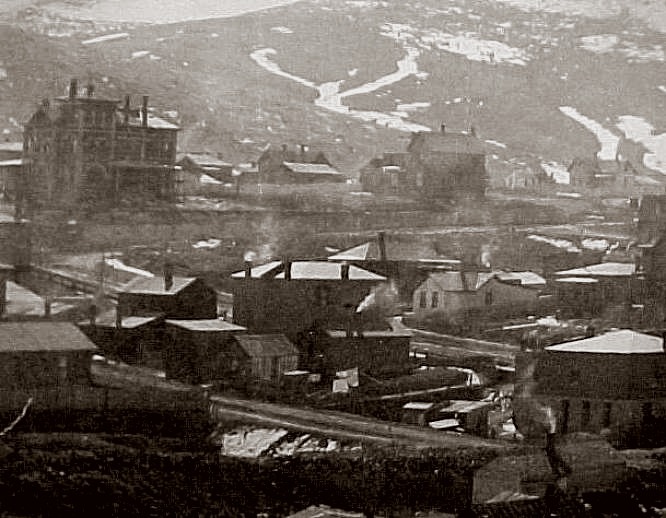 Bridge St. was renamed State St. in 1889. 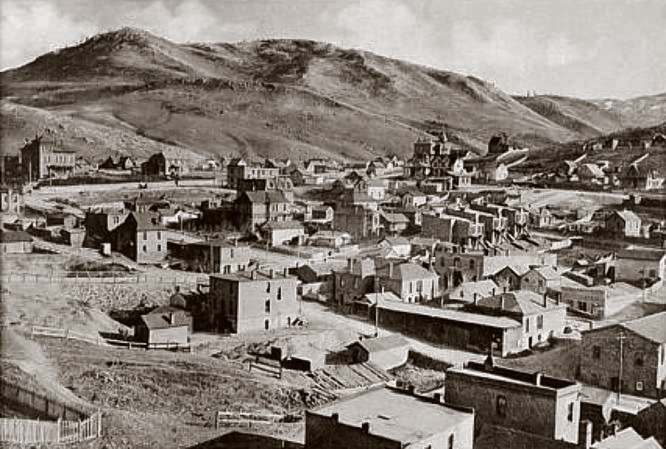 Several devastating fires raged along Last Chance Gulch during the 1870s. The one pictured above likely occured in 1871. The large brick building is the International Hotel, on the corner of Main and Bridge (later State) Street. 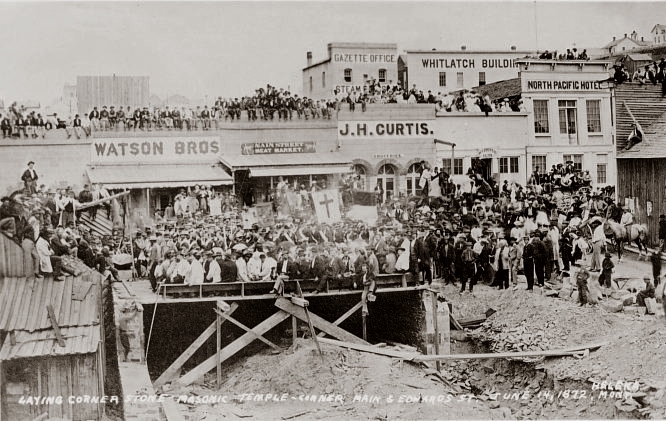 The laying of the cornerstone of the Masonic Temple, NW corner of Main and Edwards Streets, June 14 1872. This image is taken from a 1930s photo postcard, sold (and likely produced) by the Jorud Photo Shop. What makes this photograph even more interesting is that just 71 days after it was taken, virtually all the buldings pictured were destroyed by fire. ORIENTATION: the Whitlatch Building was located on the NE corner of Broadway and Jackson, where State Publishing was for many years. 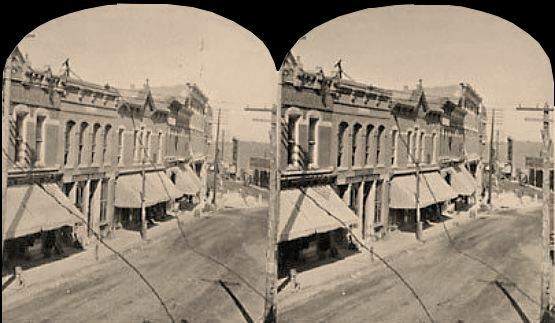 The Main Street Meat Market and J. H. Curtis were where the Atlas Block now stands. 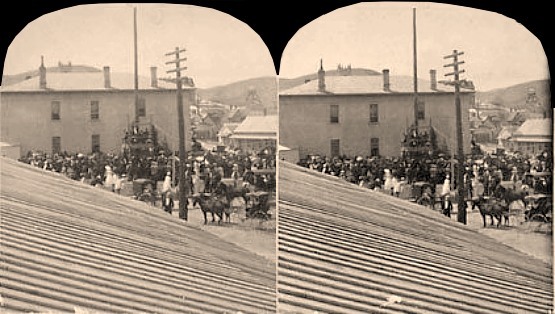 The fire began in the rear of the North Pacific Hotel on August 23 1872. High west and southwest winds carried burning embers eastward up Broadway, and northward toward Grand St. The loss was spectacular, but rebuilding commenced immediately. The approximate extent of the 1872 conflagration. Note: You can see such images in 3-D without the use of a viewer by unfocusing your eyes as you may have done for the popular "Magic Eye" posters. A lovely view, but where are all the people? 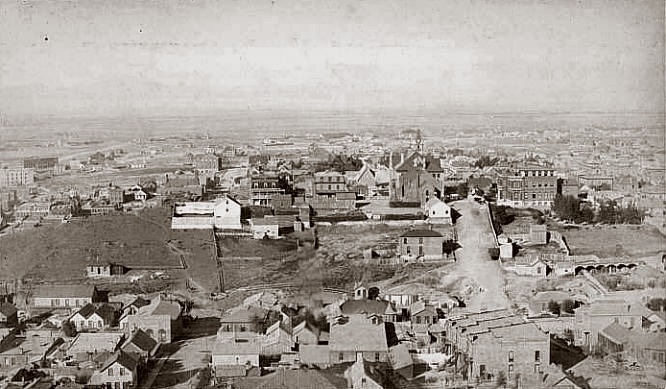 The large home at the top left, on the SE corner of State and Rodney, was owned at different times by two pioneer Helena merchants, A. G. Clarke and H. M. Parchen. Looking north across State St., ca. 1885. The large building on the right is St. Vincent's Academy, a Catholic school. Across S. Ewing St., to the left, is the first St. John's Hospital.